Perineal urethrostomy (PU) is the surgery of choice after total penectomy and urethrectomy and is also used as the last resort for recurrent strictures and for complex posterior urethral strictures. Stomal stenosis post PU is a common problem. Management options for patients with PU stomal stenosis are dilatation, buccal mucosal augmentation of stoma, PU revision, and continent catheterizable urinary diversion. In the present case, Turner-Warwick scrotal drop back procedure (TWSD) was used to revise PU. The aim of this article is to describe the technical aspects of TWSD. A 67-year-old male with a prior history of PU presented with stomal stenosis being managed by a suprapubic catheter. PU was first performed 6 years ago but he developed stomal stenosis for which a revision PU was performed. Because of recurrent stomal stenosis, and failed stomal dilatations, the patient was managed with a suprapubic catheter (SPC). On examination, lichen sclerosus changes were present at the external urethral meatus and the scrotum was normal. Two sites of stenosed PU stoma and multiple perineal incisions suggesting previous Blandy flap operations were seen. Retrograde urethrogram (RGU) was performed through the external urethral meatus [Figure 1]a and stenosed PU stoma [Figure 1]b suggesting normal membranous urethra with SPC in situ. After taking consent for surgery and routine preoperative evaluation, the patient was posted for revision PU. As he had undergone multiple flap procedures in the past, further flap procedures were deferred and TWSD was performed. Under spinal anesthesia through a vertical incision over the scarred perineum [Figure 2]a, the urethra was exposed and the healthy proximal end of the urethra was identified by passing a sound antegrade. Proximal urethral end was dissected and the mucosa was everted and sutured to the corporal bodies [Figure 2]b. Several sutures were then taken all around the urethral end with 4–0 vicryl. Scrotal skin was invaginated toward the opened urethra, and an incision was made in the anterior part of posterior scrotal skin equal to the length of the opened urethra. Urethral sutures were then brought out of the scrotal incision and were taken through the scrotal skin at all the corresponding points [Figure 2]c. All the sutures were then tied sequentially to keep the scrotal opening apposed with the urethral opening resulting in a well-fixed mucocutaneous junction. An 18 F Foley catheter was then passed per urethra. The remaining opening in the perineum and the scrotum was closed in transverse fashion after placing a drain [Figure 2]d.
The patient was discharged on the 4th postoperative day after removing the drain and per urethral Foley catheter. He was advised urethral calibration once every 3 months for the 1st year after surgery and annually thereafter. At 6 months follow up, he was voiding well but had developed redness and excoriation of the peri-stomal scrotal skin for which skin care was advised. PU stomal stenosis is a common problem and is seen in 10%–30% of the cases. The possible reasons for the failure are recurrent disease and poor vascularity of the urethra, or of the local skin flaps. Management options for patients with PU stomal stenosis include dilatation, buccal mucosal augmentation of stoma, PU revision, and continent catheterizable stoma., Most commonly accepted and versatile procedure is the Blandy flap PU, and the other varieties include Johanson technique, 7-flap PU, TWSD, and lotus petal flap PU., All the mentioned techniques have their own advantages in different clinical situations. However, during the revision PU, the skin flap viability is questionable because of the previous surgery and dissection, and sometimes, flap may not reach the urethra and cause wound dehiscence. For revision of PU meshed split-thickness graft, buccal mucosal augmentation of stoma and perforator-based lotus petal flaps have been reported in the literature.,, Preoperative assessment of the posterior urethra can be performed by RGU, voiding cystourethrogram (VCUG), or antegrade cystoscopy. In the present case, RGU was performed, but VCUG would have better as the patient was on SPC. TWSD has been described in the literature as a surgical procedure for primary PU, but is uncommonly utilized. However, it is very useful in patients requiring revision PU and in cases of PU following previous multiple perineal surgeries where the blood supply of the flap is questionable. Kulkarni et al. managed complex pelvic fracture urethral injury with ischemic bulbar urethral necrosis by TWSD in three patients and reported success in one. A common problem with TWSD is eczematous reaction of the scrotal skin due to urinary alkaline dermatitis. Even with good surgical technique, it is inevitable to have cross synechial adhesions and stenosis that require dilatation. Hence, our patient was postoperatively advised urethral calibration once every 3 months for the 1st year of surgery and annually thereafter. TWSD is a viable option for revision PU. Lumen N, Houtmeyers P, Monstrey S, Spinoit AF, Oosterlinck W, Hoebeke P, et al. 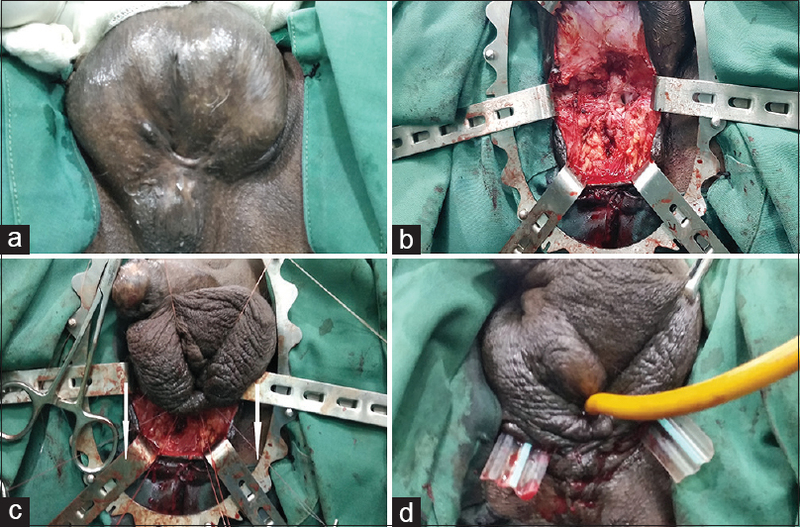 Revision of perineal urethrostomy using a meshed split-thickness skin graft. Case Rep Nephrol Urol 2014;4:12-7. Kamat N. Perineal urethrostomy stenosis repair with buccal mucosa: Description of technique and report of four cases. Urology 2008;72:1153-5. Lumen N, Beysens M, Van Praet C, Decaestecker K, Spinoit AF, Hoebeke P, et al. Perineal urethrostomy: Surgical and functional evaluation of two techniques. Biomed Res Int 2015;2015:365715. Reilly D, Sham E, Chee J, Chauhan A. Novel application of the lotus petal flap in high-risk perineal urethrostomy: principles and outcomes. Australas J Plast Surg 2018;1. Available from: https://www.ajops.com/index.php/ajops/article/view/17. [Last accessed on 2018 Nov 14]. Kulkarni SB, Joshi PM, Hunter C, Surana S, Shahrour W, Alhajeri F, et al. Complex posterior urethral injury. Arab J Urol 2015;13:43-52.